The old fashioned porch rocker is back! Plus this Amish Ladder-Back Porch Rocker is handcrafted in the USA! A pair of these painted porch rockers will bring some classic ladder-back style to your front porch. If you prefer to do the painting or staining yourself then order these ladder-back rockers unfinished. This Amish made rocker ships assembled and ready for use! This outdoor Amish furniture is intended for use on porches or other sheltered areas, painting or staining is recommended. 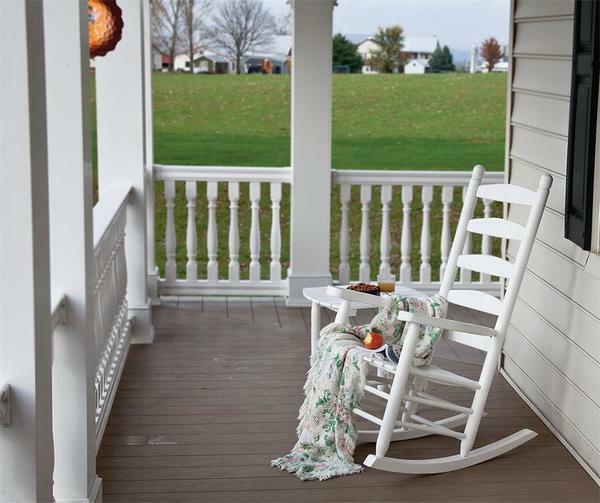 Add beauty and comfort to your yard or patio with the Amish Ash Painted Ladder Back Porch Rocker. This Amish Patio Ladder Back Porch Rocker is made of solid Ash wood. It’s built by Amish woodworkers with a careful attention to detail and a commitment that reflects time-honored traditions of integrity, simplicity and hard work. Pair this porch rocker with our Ash Wood End Table for a handy spot to set your drink.